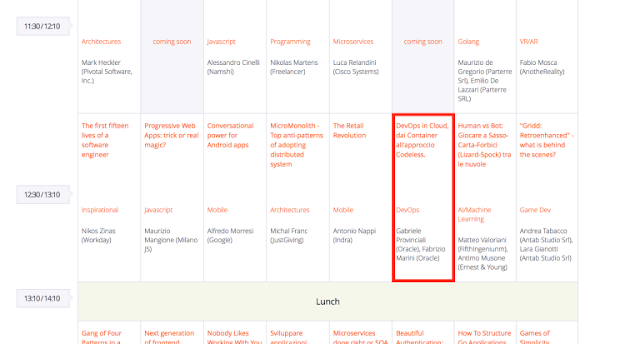 Codemotion Milano 2016: Parlerò di "DevOps in Cloud, dai Container all’approccio Codeless"
Un approccio moderno allo sviluppo software dovrebbe sfruttare linguaggi ed ambienti appartenenti a diverse tipologie di innovazione: DevOps per automatizzare continuous integration e continuous delivery, il Cloud per gestire il ciclo di vita del software in qualsiasi momento, i Software Containers per raggiungere livelli di scalabilità adeguati alle dimensioni dell’audience e un approccio Codeless per confezionare applicazioni e cruscotti ad uso dell’utenza business. Il talk sarà articolato intorno a queste quattro aree mostrando principalmente esempi pratici. I assume that you have already Installed and Configured a Cluster (Traditional or Dynamic) on WLS. it is very simple, on windows you must only unzip the file. Now unzip the content of the file WLSPlugin12.2.1.1.0-Apache2.2-Apache2.4-Win64-12.2.1.1.0.zip inside a folder. You must remember that in httpd.conf file you have only defined 2 Managed Server that at he moment are part of the Dynamic Cluster. If one or more servers in the static list fails, the plug-in could waste time trying to connect to a dead server, resulting in decreased performance. If you add a new server to the cluster, the plug-in cannot proxy requests to the new server unless you redefine this parameter. WebLogic Server automatically adds new servers to the dynamic server list when they become part of the cluster. Only the cluster master would send the list after collecting the details which servers are up and read to servers client request, NOT each servers sends the list. Verify that there are no limitation on the LAN between the 2 Machines, you must be able to ping Machine_B from Machine_A and Machine_A from Machine_B. Verify also that there in not an active firewall. Create a Domain with Admin Server on Machine_A. Stop the AdminServer and verify that there are no Active Servers and no JVM running in your Domain. Now we must create a compressed copy of the Domain ("base_domain") that you have created on Machine_A, transfer and uncompress it on Machine_B. pack -managed=true -domain=c:\FABRIZIO\demo_wls\user_projects\domains\base_domain -template=c:\FABRIZIO\demo_wls\user_projects\domains\basedomain_managed.jar -template_name="MyBaseDomain"
Wait until AdminServer is Running. When you use the “pack” command with the “-managed=true” option, the configuration framework includes changes to the nodemanager.properties file in the template file. When you use the “unpack” command on the remote host where you want to run your Managed Servers, the configuration framework sets up the domain, regenerates the nodemanager.properties file, generates a nodemanager.domains file (no need to run nmEnroll! ), generates a DemoIdentity.jks keystore, and generates a startNodeManager script.